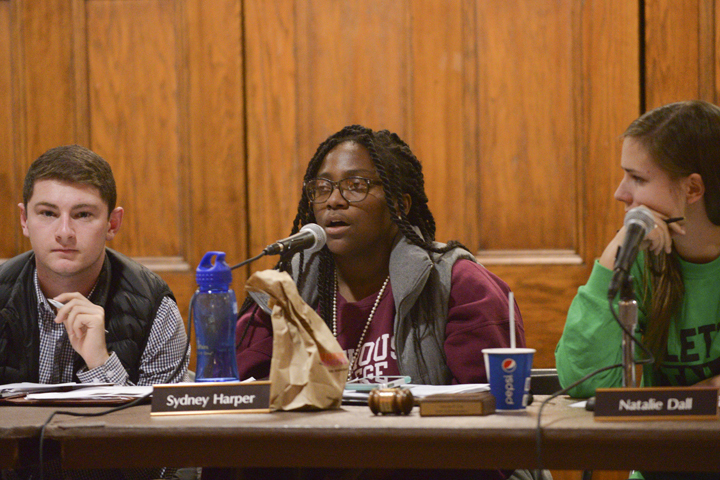 With two projects, Pitt Student Government Board is aiming to highlight student achievement and diversity, Board members said Tuesday. Pitt Voices, SGB’s second project, is moving forward as the SGB Diversity Committee continues to meet and discuss the implementation. The concept for Panther of the Month originated last year from former Board member Meghan Murphy who wanted to highlight the students who make a positive impact during their time at Pitt, but SGB implemented the idea too late last year, and there was only time for one Panther of the Month award last year. Board member Sam Jankowitz implemented the project again at Tuesday’s meeting. “The idea is to recognize students who are passionate about making Pitt better for everyone here,” Jankowitz said. Students can nominate themselves or someone else any time before Oct. 31. Each month, the application will be available until the last day of the month and the winner will be announced in the next week or two. Initially, students had to be involved in three different organizations, but this year the Board decided to emphasize the quality of involvement more than the quantity. The only criteria for students is that they must be enrolled as full-time undergraduate students at the Pittsburgh campus. Pitt Voices, the second project, is a photojournalism project culminating in a published magazine, led through SGB, that aims to highlight the experience of minority and marginalized groups on campus. Based loosely off the Humans of Pitt project, the publication will be made up of portraits and more in-depth interviews with Pitt students. The project will culminate with a magazine published by March 2017. Anish Kumar, a senior linguistics major, co-founded Humans of Pitt and is leading Pitt Voices. “[Pitt Voices] is a diversity campaign focusing on the minority identity present on campus that people don’t always know is there,” Kumar said. Kumar became intrigued with the idea of doing a larger project on diversity after a conversation with some of his friends led Kumar to think people at Pitt are not aware of the minority groups present at Pitt. Since this year is Pitt’s Year of Diversity, Kumar said the Pitt Voices project is coming at a particularly good time. SGB agreed to help spearhead the formation of the publication and created a committee to work on making the project a reality. The SGB Diversity Committee this semester has been working to assemble photographers and writers interested in the project. They do not yet have a count of the number of people involved. Board member Alyssa Laguerta said she is excited about the legacy a published work on diversity will have. SGB plans to invite the University to potentially collaborate and help fund the project. Pitt Voices aims to wrap up the preliminary meetings and planning by the end of this semester. They may release periodic online publications next semester leading up to the print version. Club Golf Team: The Pitt Club Golf Team requested $7,927.68 for registration and airfare to the national championships. The Board approved $7,103.68 and denied $824. Men’s Club Soccer: The Pitt Men’s Soccer Club requested $2,060 for registration and lodging for the regional tournament. The Board approved $1,970 and denied $90.